One of the busiest stretches of the M6 has fully reopened after a 140-tonne footbridge was removed. Burton Bank, between junctions 13 and 14 in Staffordshire, was dismantled and "all evidence" of it removed in under 12 hours, Highways England said. It was nearly 200ft in length and contained enough concrete to fill some 20 tipper trucks, it added. 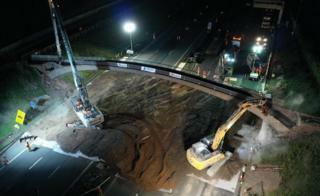 The stretch reopened in both directions by 07:30 GMT on Sunday, several hours ahead of schedule. It closed at 20:00 the previous day and was expected to remain so for up to 18 hours. The curved shape of the footbridge meant there would not have been enough headroom for HGVs to travel underneath when the hard shoulder becomes a new lane, Highways England said. The bridge, north of junction 13, was built in the early 1960s.